and start accepting orders within about a day. 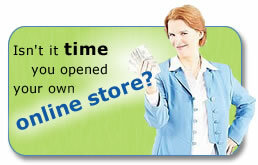 Click Here to Start Your Online Store Today! Why pay someone else thousands of dollars to build & maintain your online store when you can do it yourself for less than $35 a month? Included with your website is everything you need to begin a successful E-commerce website, and start earning a profit from it. "Thanks - YOU ARE A STAR! I am extremely grateful for your cooperation and generosity---- I will definitely use your business to set up my sister's doggie daycare site next month." Seminary Site "There will be an extra star in your crown when you get to heaven : ) ... Again I thank [you] for your work... and I appreciate your patience and help."